Overview - The Attends Underwear Super Plus Absorbency are a pull up style that is just like your normal underwear. They are for those who need moderate to heavy incontinence products. The cloth-like stretch panels provide superior comfort while the tear-away sides offer an easy option for removal. There is colored stitching on the product that indicates the back of the product for ease in putting on. This products is slim-fitting, comfortable and discreet. They feature a cloth-like backing material that is waterproof while quiet to wear. Absorption – This product contains additional super absorbent polymer and cellulose fibers to the Super Plus absorbency. The triple-tier moisture locking system (cellulose fibers, microporous acquisition layer, super absorbent polymer) has given the product greater improvements in absorbency and odor control. Fit – There are comfortable belly and waistband elastics. The color stitching at waistband indicates the back of product. The tear-away sides allow for easy removal. The leg-cuffs are the ultimate defense in leakage control. They are a uni-sexed product available in a wide range of sizes. Odor Reduction – The triple-tier moisture locking system helps also to eliminate any odors that may be present. The quick wicking away of moisture eliminates the air-bound odors. Additional Products – You can also add booster pads to add to the capacity of this product. You may need a little extra protection at night. This product is also available in the bariatric sizing in 2xlarge. Another product for daytime use with the same features would be the Tranquility Premium Day Time Underwear. Suggestions Alternatives - Style and Also Bowel – If you prefer a diaper with tabs over the pull ons, a good alternative would be the Attends DermaDry Briefs for Heavy Absorbency. If you need product for bowel incontinence, a good product would be the Tena Discreet Protective Underwear. 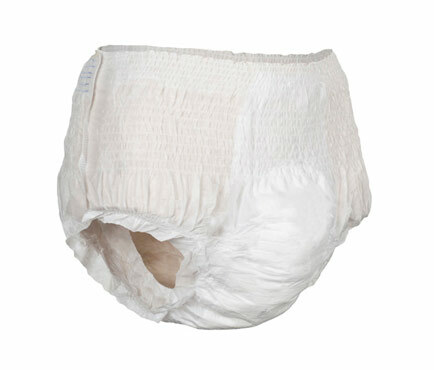 The Attends Underwear Super Plus is not made for bowel incontinence. Note that the Attends Underwear Super Plus is more expensive than the Tranquilities or the Prevail, but some people have found that the features and fit of the Attends is preferable to the other two. Please check each out and start with a small pack. I order size medium in the product I am using, I guess I need a medium in this product also? You will need to take your waist measurement at the belly button. Take that measurement and apply it to the sizing chart for the proper size in this product. A medium in your current product is not necessarily a medium in this Attends product. Each brand is different. Why do they use a “cloth-like” material on the backing? This is done for a softening effect. The plastic type backing makes a “rustling” noise when you move around in them. The “cloth-like” backing does not make this sound. This only goes up to a 68 inch waist. Is there a larger size? Yes, there is the Attends Bariatric Underwear in XXL available. This is my first time trying product, should I order a pack or case? We suggest ordering by the pack, if available, for first time orders of products. The return process is a time consuming process. By the time you use up the pack of product you will know if that is the product for you and can reorder a case. I only want a pack, do I pay freight? Shipping is free for all orders, including packs, in the Continental US. 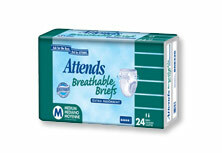 About Attends – Attends has been in the adult incontinence product manufacturing for over 30 years. They are committed to delivering product innovations that improve the quality of life for people with incontinence needs. They produce a high quality, high performing product. This is our favorite day time adult underwear for my mother in law. She is at a stage that Attends truly understands and there product is superior to that of big box store items. Attends is super absorbernt, helps prevents from infection, easy to pull on, pull off, and continualy wisk away the moisture from my mother in law. This is what the care facilitiy used and we are delighted we can purchase Attends for in home care. They are very comfortable to wear. They don't leak. They are pull ups which I prefer.